Infections of the head, especially severe sore throat, acute influenza and severe common cold with symptoms of sore throat, tonsillitis, fever, chills, thirst, aching neck and shoulders, headache, swollen lymph nodes. Pediatric imbalances such as tonsillitis, ear infections, measles, mumps, chicken pox. Skin infections with fever including boils and carbuncles are some of the imbalances satisfied clients have used this product for. Clears Heat, Expels Toxic Heat, Disperses Wind-Heat, Cools the Blood, Benefits the Throat. 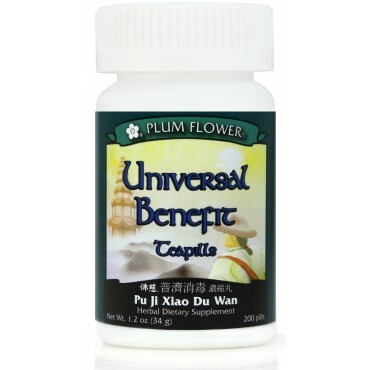 Scutellaria baicalensis root-wine fried, Coptis chinensis rhizome-wine fried, Scrophularia ningpoensis root, Platycodon grandiflorum root, Bupleurum chinense root, Citrus reticulata peel, Glycyrrhiza uralensis root, Forsythia suspensa fruit, Arctium lappa fruit, Mentha haplocalyx herb, Lasiosphaera fenzlii puff-ball, Isatis indigotica root, Bombyx mori, Cimicifuga heracleifolia rhizome, Activated carbon, Botanical wax, Talcum. - Jiu chao huang qin, Jiu chao huang lian, Xuan shen, Jie geng, Chai hu, Chen pi, Gan cao, Lian qiao, Niu bang zi, Bo he, Ma bo, Ban lan gen, Jiang can, Sheng ma, Activated carbon, Botanical wax, Talcum.